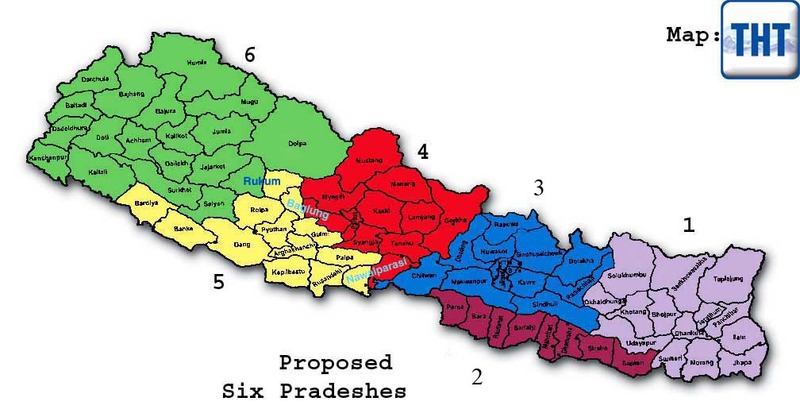 The four major political parties of Nepal have proposed division of Nepal into six federal states. See respective pages for a detailed comparison of ECONOMY and POPULATION across all states. The charts below show a basic comparison of population and economy across all six states. The bar graph below shows a quick comparison of six states and their respective GDP at Market Price. The bar graph below shows percentage of population in each of the six proposed federal states. Two of these federal states, state 2 and 5, lie in Terai, locally known as Madhesh. State 2 and 5 comprise 20.4% and 16.4% of Nepal’s population respectively.